…energy psychology is what I’m talking about. I’m taking a look back and interview with expert guest Bruce H. Lipton, PhD. Bruce shares his introduction to energy psychology as he witnessed a dramatic transformation moment first hand. 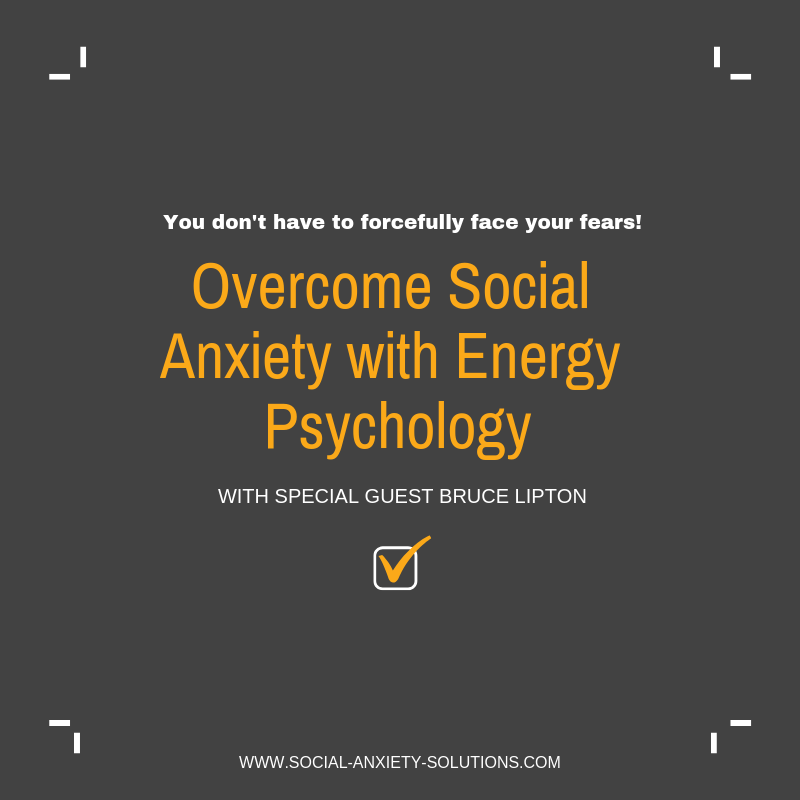 You have access to these powerful tools within energy psychology to overcome social anxiety. You have access to clear your issues at the root of the problem. And in a way that doesn’t require you to forcefully face your fears. 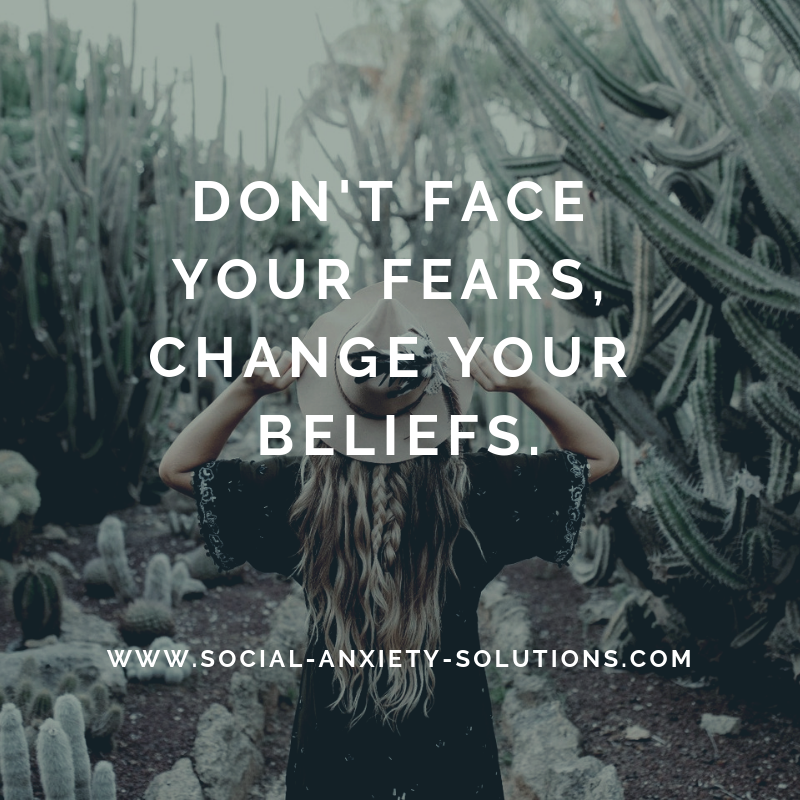 I’d recommend using a practitioner for most of these tools to guide you, but with something like EFT Tapping, you can give it a go right away yourself to start chipping away at your social anxiety problem. Sebastiaan: Hi, my name is Sebastiaan van der Schrier. I’m a former social anxiety disorder sufferer and a social confidence coach. In the past almost ten years I’ve been helping socially anxious clients to go from social anxiety they’ve often had for decades to feeling calm relaxed and at ease in social situations. I’ve logged close to 5,000 coaching hours and throughout my coaching I combined Western traditional psychology with Eastern energy psychology. Eastern energy psychology kind of imagine that to be like an umbrella and then the spokes in the umbrella have different kinds of techniques. One of the techniques that I talk about a lot in my videos in my podcasts is EFT which stands for Emotional Freedom Techniques or tapping which is a psychological form of acupuncture but instead of using needles you tap put with the tips of your fingers at specific acupressure points in the body. Now, when you do that and you’re focusing on a particular problem the negative emotions connected to that problem start to dissolve, release and neutralize. It’s amazing. Now when you hear this for the first time you probably think it’s a scam. That’s why I do this video because in this video in just a moment you’ll see some highlights of the interview that I did with PhD researcher and biologist Bruce Lipton. He will talk about one of the other spokes in the umbrella called “Psych-k”. It’s one of the other techniques. I’m a practitioner of that technique as well. It’s amazing. It’s a way to install positive belief directly into your subconscious mind. If you have heard of affirmations – “I love myself. I love myself. I love myself” say it over and over, say it in the mirror, say it with conviction, say like you mean it. The things that don’t work so well. This is like that but on steroids and this actually does work. Energy psychology is amazing, amazing. Not saying we don’t want Western traditional psychology because changing your thoughts is important, changing your behavior is important of course, but there’s a key element missing and that’s dealing with the energetic and the emotion side of things. When you want to overcome your social anxiety, which is an emotional problem that’s where you’re going to get the most bang for your buck so to speak. Alright, on to my interview with Bruce Lipton. Sebastiaan: Bruce Lipton is a PhD and he’s a former medical school professor and research scientist. His studies revealed that the environment operating through the cell membrane controlled the behavior and physiology of the cell turning genes on and off. These discoveries which ran counter to the established scientific view that life is controlled by the genes, priests aged one of today’s most important fields of study – “The science of epigenetics”. We are not victims of our genes. Bruce’s research helps us to understand we’re in control of our life and that we can take control over our life by taking control of our inner wiring. Bruce is the best-selling author of the “Biology of belief”, he’s been a guest speaker on hundreds of TV and radio shows and he’s kind of a superstar in the in this whole field so I’m very honored to have him on the show. 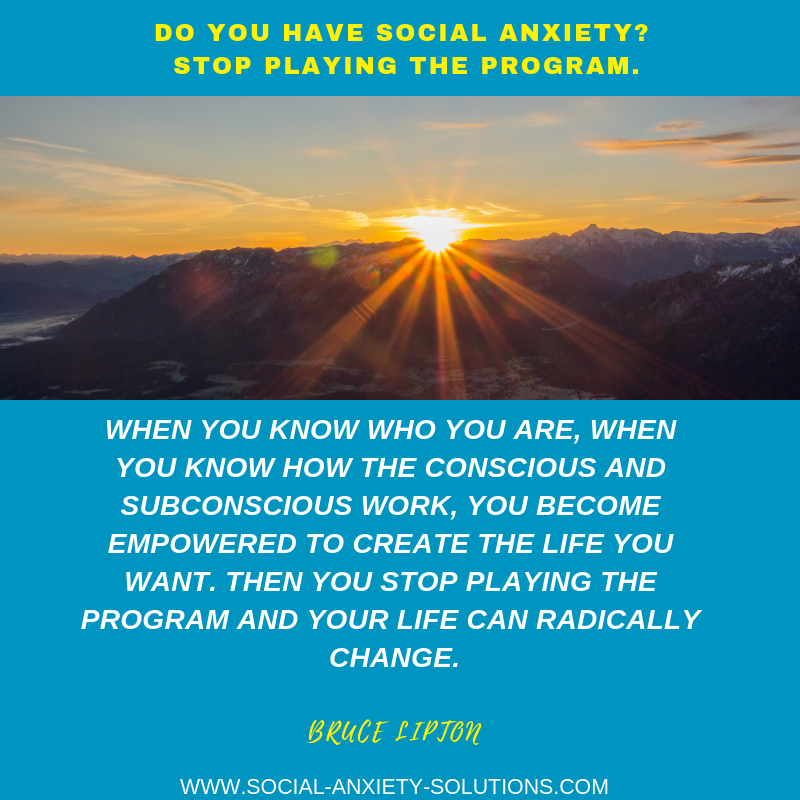 The programs that you’re talking about like someone who now has social anxiety and they’re like, “Well, I don’t want to have social anxiety, I want to have social ease, I want to enjoy myself, I want to be comfortable” but it’s the programs that they’re having that come from the repetitive negative experiences. The things that they’ve observed in their early childhood that then formed the beliefs and the programs as the result of these belief that they’re now having. They want to get over it, but I just have to force myself to face my fears and then maybe I’ll learn that I’m actually okay when I do that. But you’re swimming upstream and since yes, you can consciously take control to a degree but only 5% of the time and once you turn your back or once you’re not paying attention then the programs are running the show again. 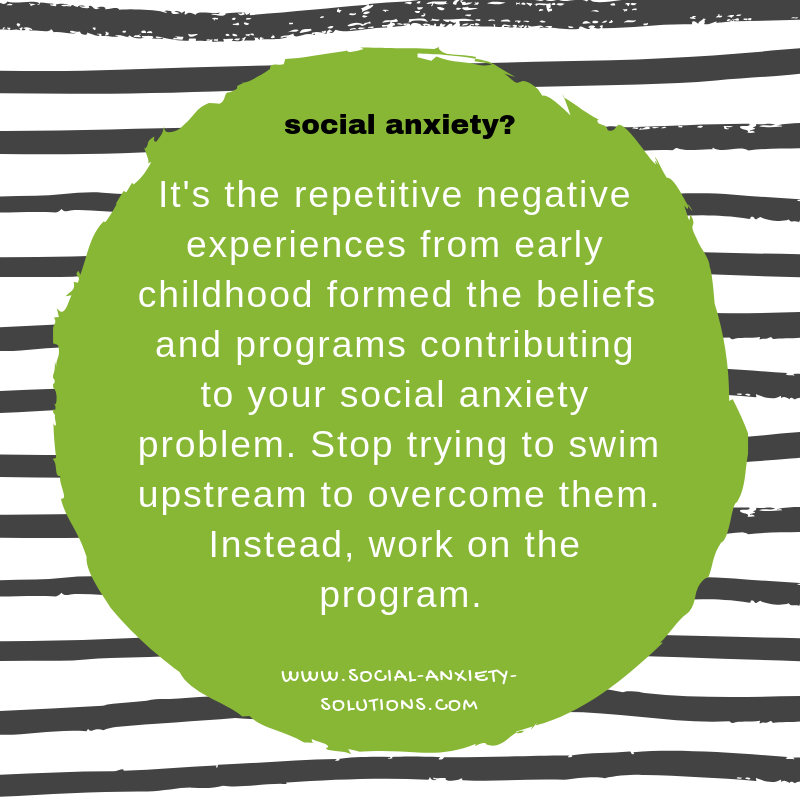 The question is or kind of where we ended was well, how is it then that were attacking these programs or rather how do we shift and change these programs that we’re currently dealing with that are causing the problem of anxiety? I know that you’re an advocate of energy psychology and I’m wondering what your personal experience with that was and how you got into that? Bruce Lipton: I was giving a lecture in Colorado in the Rocky Mountains and I gave the lecture and concluded just as I just said, oh, it’s the subconscious that’s in the way and it’s not your genes and thank you very much and then the first question is how do you change it and I go I don’t know how to change it. And the fun part was as soon as I upset as usual because I thought the lecture was really great but the moment I finished the lecture they didn’t care about what I just said, they just wanted to go “Now, how do I change it?” And I was feeling like, “God, I thought the science was really great, but it doesn’t save anybody”. I put my computer in my bag and I was going back to the back of the room and the next speaker who was coming up his name is Rob Williams and I could hear as I was walking back to my seat he says, “I’m going to show you how to change those beliefs Bruce talked about”. And I go okay, sure. It was kind of funny because he asked the audience, big audience, he said “How many people would like to change a belief?” And almost everybody the hand goes up. It was funny because I saw the same person that he saw and it was a woman who wasn’t sure, she put her hand up and like that and we both saw her. The fun part was I saw her and then he sees her and he says, “Okay, you tell us your name and what your problem is?” And everybody looked at her and she just turned beet red, she just turned red. Not a word, she couldn’t say her name, she couldn’t talk. He left from the front of the room, got in the middle of the audience and got next to her and had a private conversation. Her name is Pauline, we find that out and guess what her problem is? She can’t speak in public. Well, it was pretty darn obvious, she couldn’t even say her name. She was so psychologically like that. I’m thinking, “Well, this guy Rob Williams is a pretty brave guy or crazy. How do you know you’re going to fix somebody? You’re going to fix somebody, you’re going to tell us and then you’re going to fix somebody? I thought that that’s pretty much confident. They go up on the stage and he shows her the process which is called Psych-k. P-S-Y-C-H and K. It’s ten minutes, she’s giving a lecture, she’s walking up and down the stage talking about her history, talking about her family, talking about everything. Rob said, “Pauline please sit down you’re using my lecture time”. That was the first time I saw energy psychology and what happened? Less than 10 minutes this whole fear of talking was changed so much that he had to ask her to stop talking after 10 minutes. It’s like whoa. My first introduction is called energy psychology and it’s a super learning technique and it’s an ability to rewrite programs. I need people understand out there, there is no gene connected with this social anxiety problem. There’s not one gene been found. As I said genes cause less than 1% of pathologies in the first place so stop looking at the genes. Why is this relevant? Because when you know who you are, when you know how the conscious and subconscious work you become empowered to create the life you want. For many people there’s a period in your life where you stop playing the program in your life radically changed when you were not playing that program. Sebastiaan: All right. Now Bruce was talking about Psych-k which is one of the spokes in the umbrella. By the way he gave an example there of someone coming to the stage and resolving their long-standing issue. That doesn’t always happen in five or ten minutes but that wasn’t his first experience with it. Psych-k is one of the spokes in the umbrella being energy psychology. Psych-k is amazing as are many of the other techniques: logo synthesis, intention-based energy process, T-80 and tapping. What I like about tapping is that it’s such a self-help tool. If you want to do psych-k you’re going to see a practitioner. By the way seeing a practitioner is the best investment of your money ever because doing something on your own you’ll have blind spots certain things you can’t see, you think you’re aware of your issue but your subconscious hide certain issues from you beyond the topic of this conversation. It’s a world of difference when you see a practitioner versus when you work by yourself. Tapping is one of the other spokes in the umbrella of energy psychology that is actually very easy to self-apply. Even if you don’t work with a practitioner you can already make some really good changes and reduce your social anxiety using just that technique. I teach how to do that technique for free. For how much? For free on my website because I share with you a social confidence starter kit. It’s ten short videos five or ten minutes each and I teach the technique to you and I teach how to apply it to parts of overcoming your social anxiety and I also guide you through an experience of the technique. You actually feel it working so that you think of an upcoming social situation, you feel the anxiety and I guide you through some tamping and you feel less anxious. It’s amazing. You’re going to love that. I also have my eBook in there, “How to overcome social anxiety completely?” where I tell my own story how I overcame my social anxiety and I share with you how to step-by-step overcome your social anxiety completely and why it is that you can go from social anxiety to feeling totally calm, relaxed and at ease. No anxiety whatsoever in social situations because that’s possible, that’s your normal state of being. If you’re interested in that you can get that free social confidence starter kit on my website which is social-anxiety-solutions.com or click the link below this video. I hope this has been helpful. Please share this and I’ll talk to you soon. Bye.